Ďurkovič, J., Kačík, F. and Olčák, D. (2015). An Evaluation of Cellulose Degradation Affected by Dutch Elm Disease. Bio-protocol 5(14): e1535. DOI: 10.21769/BioProtoc.1535. 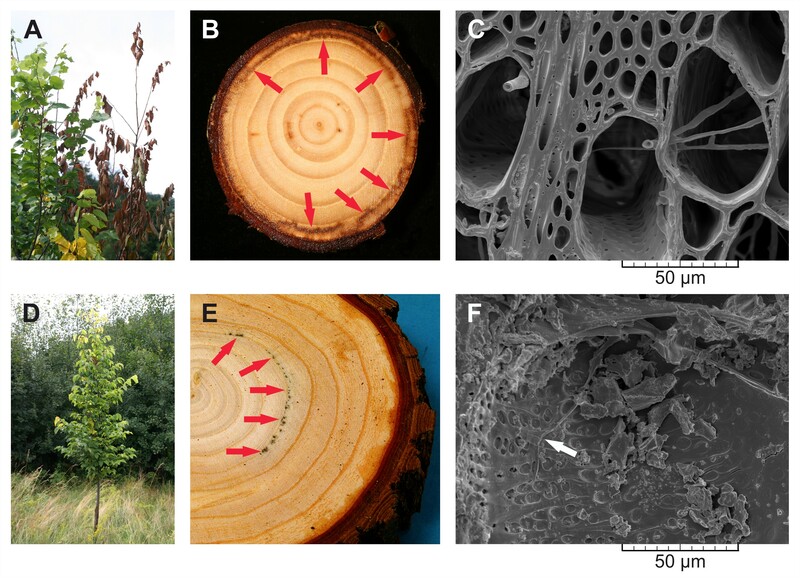 The pathogenic fungus Ophiostoma novo-ulmi spreads within the secondary xylem vessels of infected elm trees, causing the formation of vessel plugs due to tyloses and gels, which ultimately result in Dutch elm disease. Foliage discoloration, wilting and falling from the tree are typical external leaf symptoms of the disease followed by the subsequent death of sensitive trees. Cellulolytic enzymes produced by the fungus are responsible for the degradation of medium molecular weight macromolecules of cellulose, resulting in the occurrence of secondary cell wall ruptures and cracks in the vessels but rarely in the fibers (Ďurkovič et al., 2014). The goal of this procedure is to evaluate the extent of cellulose degradation by a highly aggressive strain of O. novo-ulmi ssp. americana × novo-ulmi. Size-exclusion chromatography (SEC) compares molecular weight distributions of cellulose between the infected and the non-infected elm trees, and reveals changes in the macromolecular traits of cellulose, including molecular weights, degree of polymerization, and polydispersity index. 13C magic angle spinning nuclear magnetic resonance (13C MAS NMR) spectra help to identify and also to quantify the loss of both crystalline and non-crystalline cellulose regions due to degradation. The procedure described herein can also be easily used for other woody plants infected with various cellulose-degrading fungi. Note: It is produced by Millipore Simplicity® 185 (UV) ultrapure water purification system (EMD Millipore). Select elm trees affected by Dutch elm disease (Figures 2A and 2D) and saw several wood discs, approximately 4 cm thick, from the stems at breast height 130 cm above a tree base. If forking does not allow disc sampling from the stem at this height, sample wood discs at the highest possible position on the stem below forking. Distinct infection zones are characterized by discoloration of the wood (Figures 2B and 2E) where the fungal hyphae grow and spread through secondary xylem vessels (Figures 2C and 2F). Figure 2. Dutch elm disease (DED) and the infection zones in Dutch elm hybrids 'Groeneveld' (susceptible to DED, A-C) and 'Dodoens' (tolerant to DED, D-F), which were artificially inoculated with spores of the pathogenic fungus Ophiostoma novo-ulmi ssp. americana x novo-ulmi. A. DED symptoms in an infected susceptible tree. B. Wood disc sawn from a susceptible tree, in which the infection zones (marked by red arrows) are restricted to the annual ring for current-year. Early the following growing season after an inoculation these infected trees died. C. Evidence of fungal hyphae growth inside latewood vessels within the infection zone. Cross-section in scanning electron microscopy, scale bar = 50 μm. D. Diminished symptoms of DED in an infected tolerant tree. E. Wood disc sawn from a tolerant tree which survived the infection. Infected trees continued to grow without any physiological weakening in the following years. Discolored infection zones are marked by red arrows. F. Occasional occurrence of a fungal hypha (white arrow) growing inside earlywood vessel within the infection zone. Radial section in scanning electron microscopy, scale bar = 50 μm. Separate the annual ring sections which involve the infection zones from wood discs using a bandsaw, abrasive belt machine and woodworking lathe. See Video 1 for more detail. Disintegrated and extracted wood coming only from these sections of the annual ring is subjected to size-exclusion chromatography and 13C nuclear magnetic resonance measurements. Also, separate the identical annual ring sections from the control trees to enable comparisons of macromolecular traits of cellulose between the infected and the non-infected trees. Disintegrate separated wood sections into sawdust using a Polymix PX-MFC 90D mill. Sieve sawdust to a desirable fraction (size 0.50-1.00 mm) and dry in a desiccator. Extract the dry sawdust (5 g per 250 ml of the extraction solution per sample) according to the ASTM International standard procedure D1107-96 (2013) in a Soxhlet extraction apparatus with an ethanol-toluene solution (1 L absolute ethanol and 427 ml toluene) for 6 h.
Dry the extracted sawdust in air on bench top overnight, then under vacuum at 50 ± 3 °C for at least 4 h.
Place the dry wood sawdust (1 g), acetylacetone (6 ml), dioxane (2 ml), and hydrochloric acid (1.5 ml) into a 50 ml boiling flask. Heat the flask under reflux using a boiling water bath for 30 min, then allow the mixture to cool slowly to near room temperature and add methanol (30-40 ml) in the fume hood. Dry the filtering crucibles in an oven at 105 ± 3 °C for 2 h, then cool down in a desiccator to room temperature and weigh. Filter the mixture through the previously weighed filtering crucibles. Slowly rinse the solids using the following sequence: methanol (100 ml), followed by hot water (40 ml), dioxane (40 ml), and finally methanol (50 ml). During filtration, gently apply a vacuum to remove any liquids. Each rinse step should take approximately 2 min. Dry the crucible and acid insoluble residue (i.e., Seifert’s cellulose) at 105 ± 3 °C until a constant weight is achieved, usually a minimum of 90 min. Put Seifert’s cellulose (50 mg), pyridine (8.0 ml) and phenyl isocyanate (1.0 ml) into a 50 ml dropping flask. Place the sealed flask in an oil bath and heat in the oven at 70 ± 3 °C for 72 h.
Cool to room temperature and add methanol (2.0 ml) to eliminate any excess phenyl isocyanate. Add the yellow solution dropwise into a rapidly magnetic stirring methanol: water (7:3) mixture (150 ml). Filtrate the precipitate and wash with methanol:water (7:3) mixture (1 x 50 ml), then with water (2 x 50 ml) to a neutral reaction (pH = 7.0). Dry the cellulose tricarbanilate (CTC) in air on bench top overnight, then under vacuum at 50 ± 3 °C. Dissolve CTC (2.0 mg) in tetrahydrofuran (THF) (2.0 ml) and filtrate through a Puradisc 25 NYL syringe filter (pore size 0.45 μm) into an autosampler vial using a 5 ml syringe. Inject the sample (10 μl) into a chromatograph and analyse by SEC at the following conditions: temperature of 35 °C, mobile phase (THF) flow rate of 1.0 ml/min on two PLgel, 7.5 x 300 mm, MIXED-B columns preceded by a PLgel, 7.5 x 50 mm, Guard-column. Acquire data with Chemstation software, and then import the data from Chemstation into the Clarity software. 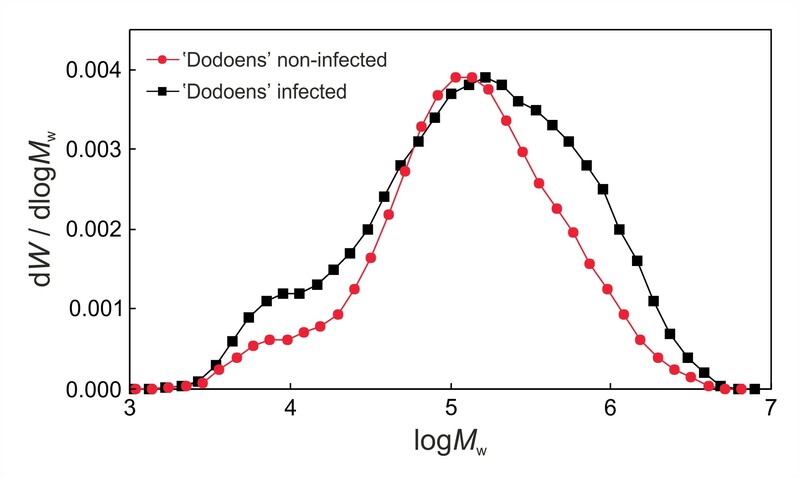 Calculate the molecular weights (Mn, Mw, Mz, Mz+1, Mp), degree of polymerization (DPw) and polydispersity index (PDI) of cellulose samples, and compare molecular weight distributions of cellulose tricarbanilates between the infected and the non-infected trees (Figure 3). Figure 3. Size-exclusion chromatography of molecular weight distributions of cellulose tricarbanilates prepared from the non-infected and infected trees of the Dutch elm hybrid 'Dodoens'. Cellulolytic enzymes produced by O. novo-ulmi ssp. americana x novo-ulmi are responsible for the degradation of mostly medium molecular weight macromolecules of cellulose (DPw values of approximately 235 to 238) which results in an substantial increase in low molecular weight macromolecules (left side of the chromatogram). At the same time, however, the infected tree responds to the infection with a significant increase in the biosynthesis of high molecular weight macromolecules of cellulose (right side of the chromatogram), followed by a shift in the peak (Mp value) to the high molecular weight area. Co-occurring biosynthetic and biodegradation processes result in changes to the macromolecular traits of cellulose (Mn, Mw, Mz, Mz+1, DPw, PDI) in the infected elm trees. For the 13C MAS NMR measurement, start with a calibration of the chemical shift scale (ppm) and measure the 13C MAS NMR spectrum of adamantane. Fill the 4 mm ZrO rotor (volume of 52 μl) with a pulverized and compacted extracted sawdust sample. Insert the rotor into the stator of T3-HXY probe for solids, insert the probe into the magnet bore, and spin the rotor to the rate of 10 kHz. Tune 1H and 13C channels of the probe. 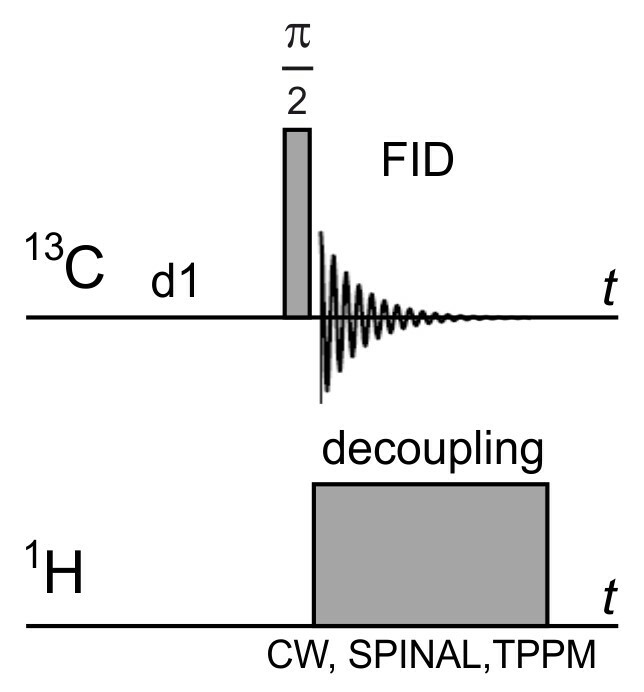 Set up the parameters of the “onepul” pulse sequence (Figure 4) - π/2-pulse width, transmitter and decoupler offsets, spectral width, decoupling type and power, and acquisition time. Measure and record the free induction decay (FID). Use Mnova 8.1 software, or a higher version, for the Fourier transformation of FIDs, as well as FID and NMR spectra processing. The software and the accompanying help manual can both be downloaded from the Mestrelab Research website: http://mestrelab.com/software/ and http://mestrelab.com/software/mnova/manuals/. 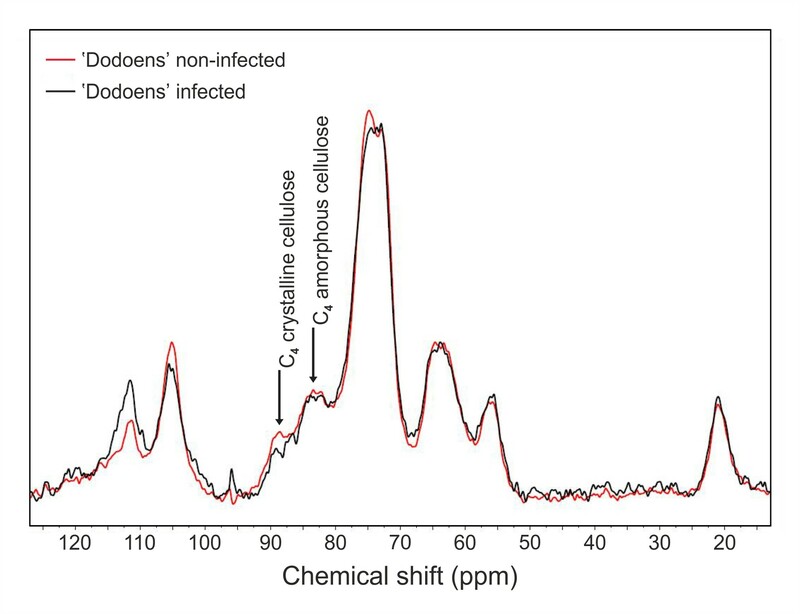 Compare signal intensities of 13C MAS NMR spectra at both 83 ppm (corresponding to C4 carbon atoms of amorphous cellulose) and 89 ppm (corresponding to C4 carbon atoms of crystalline cellulose) between the infected and the non-infected trees (Figure 5). Based on peak heights, calculate crystallinity index and the percentage loss for both amorphous and crystalline regions, respectively. Figure 5. Solid-state 13C MAS NMR spectra of extractives-free samples from the non-infected and infected trees of the Dutch elm hybrid 'Dodoens'. Signals at 83 ppm and 89 ppm correspond to C4 carbon atoms of amorphous and crystalline cellulose, respectively. The decrease in signal intensities at both resonances reveals that losses in crystalline (26.09% drop) and non-crystalline (5.26% drop) cellulose regions have occurred in parallel. We have found that syringyl to guaiacyl (S/G) ratio in lignin affected the cellulose degradability by O. novo-ulmi in the infected elm trees (Ďurkovič et al., 2014). Other recent studies also revealed that an S/G ratio has a significant influence on the cross-linking between lignin and other cell wall components, thus modifying the microscopic structure and topochemistry of the cell wall, the cell wall degradability during chemical and hot-water pretreatments, and the successive hydrolysis of cellulose to glucose (Li et al., 2010; Studer et al., 2011; Papa et al., 2012). Therefore, we suggest using standard analytical methods such as alkaline nitrobenzene or cupric oxidations, NMR, pyrolysis–gas chromatography–mass spectrometry (Py–GC–MS) or others to determine lignin monomer composition as quantified by the S/G ratio. Thereby, both the lignin monomer composition and the cellulose degradation data can provide a more complete view of the biodegradation process caused by cellulose-degrading fungi. The authors thank Dr. Miloň Dvořák, Dr. Jana Krajňáková, Dr. Miroslava Mamoňová, Dr. Ingrid Čaňová, Dr. Jaroslav Ohanka and Mr. Miroslav Rusnák for their technical assistance. This work was funded by the Slovak scientific grant agency VEGA (1/0149/15). This protocol has been adapted from our previous work (Ďurkovič et al., 2014). ASTM D1107-96. (2013). Standard test method for ethanol-toluene solubility of wood. American Society for Testing and Materials International, West Conshohocken, PA.
Ďurkovič, J., Kačík, F., Olčák, D., Kučerová, V. and Krajňáková, J. (2014). Host responses and metabolic profiles of wood components in Dutch elm hybrids with a contrasting tolerance to Dutch elm disease. Ann Bot 114(1): 47-59. Li, X., Ximenes, E., Kim, Y., Slininger, M., Meilan, R., Ladisch, M. and Chapple, C. (2010). Lignin monomer composition affects Arabidopsis cell-wall degradability after liquid hot water pretreatment. Biotechnol Biofuels 3: 27. Papa, G., Varanasi, P., Sun, L., Cheng, G., Stavila, V., Holmes, B., Simmons, B. A., Adani, F. and Singh, S. (2012). Exploring the effect of different plant lignin content and composition on ionic liquid pretreatment efficiency and enzymatic saccharification of Eucalyptus globulus L. mutants. Bioresour Technol 117: 352-359. Studer, M. H., DeMartini, J. D., Davis, M. F., Sykes, R. W., Davison, B., Keller, M., Tuskan, G. A. and Wyman, C. E. (2011). Lignin content in natural Populus variants affects sugar release. Proc Natl Acad Sci U S A 108(15): 6300-6305. How to cite: Ďurkovič, J., Kačík, F. and Olčák, D. (2015). An Evaluation of Cellulose Degradation Affected by Dutch Elm Disease. Bio-protocol 5(14): e1535. DOI: 10.21769/BioProtoc.1535.